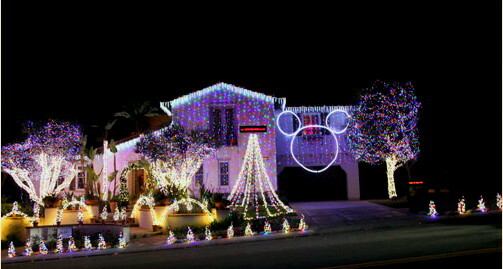 Best Christmas Display of Lights in Homes in Orange County 2012! Posted by Teresa Mihelic HelpDesk on Wednesday, December 5th, 2012 at 12:16pm. 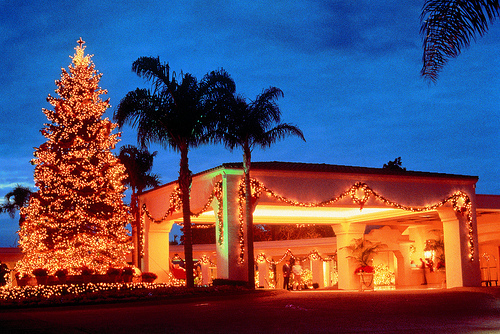 I heard it a couple of times: In Orange County, everything is over the top! When it comes to the Holidays, this statement makes no exception: just drive around, or even, walk around the neighborhoods in Orange County and you'll find a great display of Christmas lights pretty much everywhere! So we call those with the best 'outside' decorations the best Christmas homes. Many neighborhoods all over, many homes, but we will step up and give you our top 3 destinations to drive the family around and check on those wonderful display of lights! 1. This one is probably an obvious for many, but there's many folks out there who haven't enjoyed this yet : Nellie Gail in Laguna Hills. Just a quick drive around the neighborhood, (which, by the way is gorgeous as it is - with its many horse trails and wonderful landscapes), will tell you why we chose this as a number one spot. A good idea might be to just set your navigation or your 'destination' to 25473 Nellie Gail Road (this is a must see home with over 100,000 lights blinking to music, a number of Dept 56 villages on display inside the house that you actually go into) and everything around Nellie Gail Road on both sides off Oso Parkway, and some specific streets apart from Nellie Gail Road would be Fargo Rd and . These houses ( or actually, the correct way of calling them: estates), really fit the 'over the top' definition. With mature landscape, and by that I mean, really big trees, the decorations creativity goes all the way to the top. 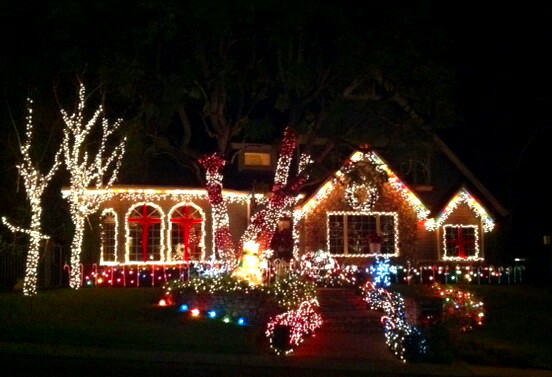 There's homes with music coordinated to the lights, etc. Plain beautiful and elegant. 2. The second spot, we tied it to two communities: Ladera Ranch and Talega in San Clemente. In this two communities, neighborhoods compete for prizes in different categories, and in some they have themes assigned, so it's really a delight to walk around here and pay attention to the details. These two communities are very family friendly so you can only imagine whats in store. Giant inflatable Santa's, fake snow, reindeers, polar beers, trains and many ( did I mention many?) , many lights. 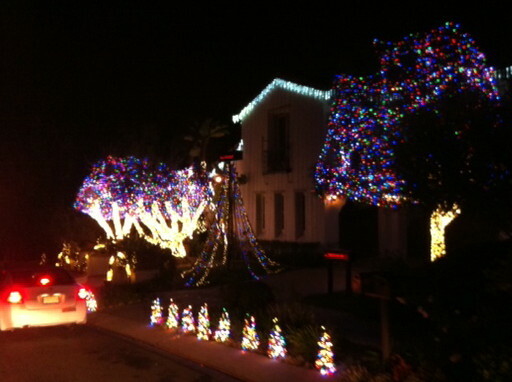 Within Ladera Ranch, we have some favorite streets where all the houses have lights: Bramford St and Sleepy Hollow. Within Talega: the Seaside ( Calle Guijarro, Calle Pelicano) and Stella Mare -Portomarin into Sabella (Via Regalo and around into Paseo Canos, Akelia). 3. Dana Point: Well, many resorts are here: The St Regis, the Ritz and the Marriott. All of them almost compete with each other on their display of lights, Christmas Tree and indoor decor. The Ritz has a fantastic version of the Gingerbread House ( is more of a Sea Village, gorgeous!) and the St Regis has sand sculptures.And while around there, enjoy the beautiful lights all over the neighborhoods of Monarch Beach. Set your destination to corner of Camino del Avion and Niguel Road towards PCH. Worth the drive! Orange County has many other areas with wonderful displays. And, there's always Disneyland if you want the complete experience! What a great place to call home!